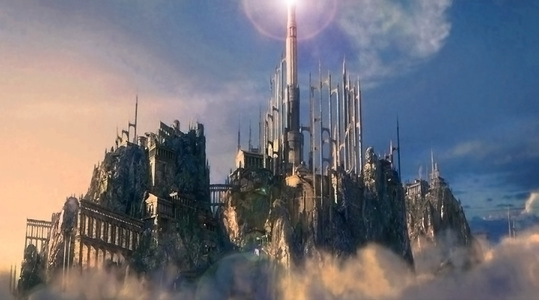 Behind the walls of the Pelóri the Valar established their domain in that region which is called Valinor, and there were their houses, their gardens, and their towers. 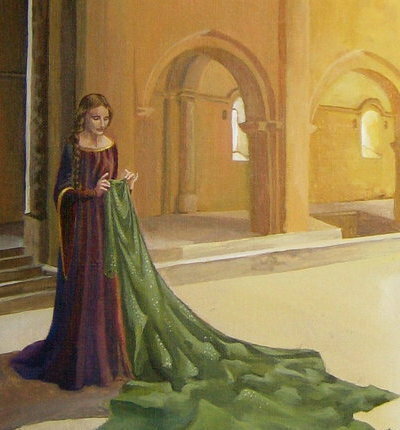 In that guarded land the Valar gathered great store of light and the fairest things that were saved from the ruin; and many others yet fairer they made anew, and Valinor became more beautiful even than Middle-earth in the Spring of Arda; and it was blessed, for the Deathless dwelt there, and there naught faded nor withered, neither was there any stain upon flower or leaf in that land, nor any corruption or sickness in anything that lived; for the very stones and waters were hallowed. Everybody knows and, rightly, loves Middle Earth, its lands, its events and its characters; but, maybe, not everyone knows completely the history, the regions and the inhabitants of Middle Earth's 'rival'/opposite and hidden continent. The 'Lands that never wither' are the realm of the Valar and their people, the Maiar, and house of the most ancient realms of the Eldar. 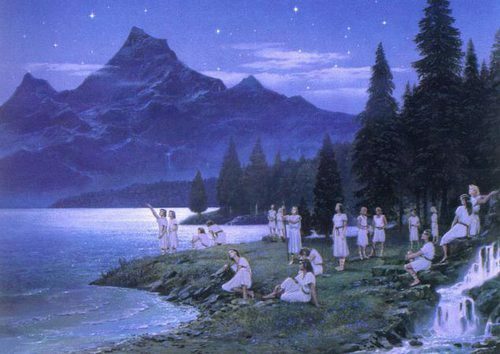 The First Elves, that decided to reach the Splendour of Valinor, faced a long and perilous journey, guided by the Vala Oromë, through Middle Earth in forgotten times, years in which all the World was dark and dangerous, enlightened only by the Stars, and Valinor was the only place blessed with the eternal and legendary Light of the Two Trees. 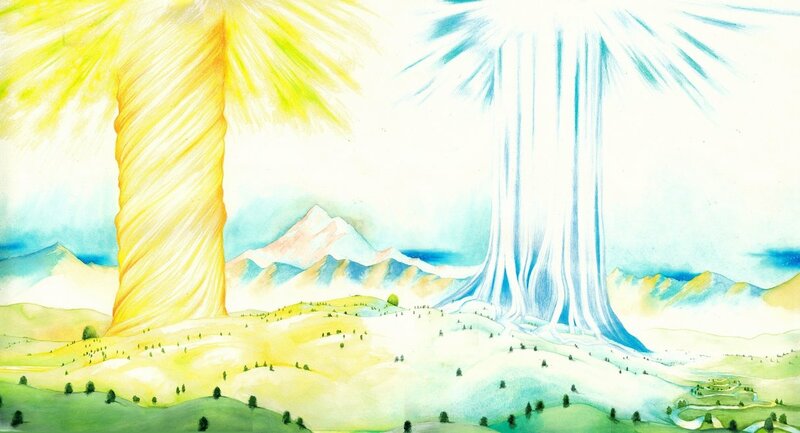 The history of the Two Trees of Valinor was deeply interwoven with the future events of Arda, from the First Age to the Third Age. 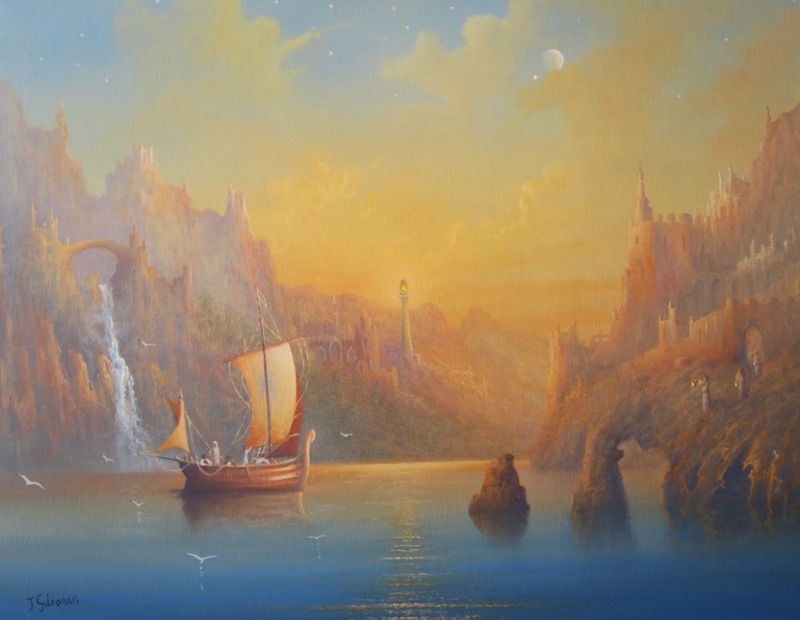 Alqualondë, or 'Swanhaven', is the city and the port of the Teleri; it was the last city to be established in Eldamar and was founded by the Falmari, the Teleri that eventually managed to reach Aman and moved from Tol Eressëa, the Lonely Island. 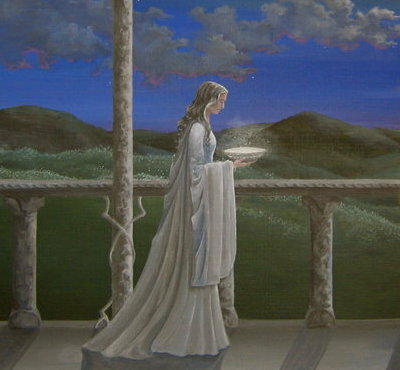 There, with the help of the Noldor, they built their Halls and palaces, made of the pearls that they used to find in the sea or of the jewels that they received from the Noldor. 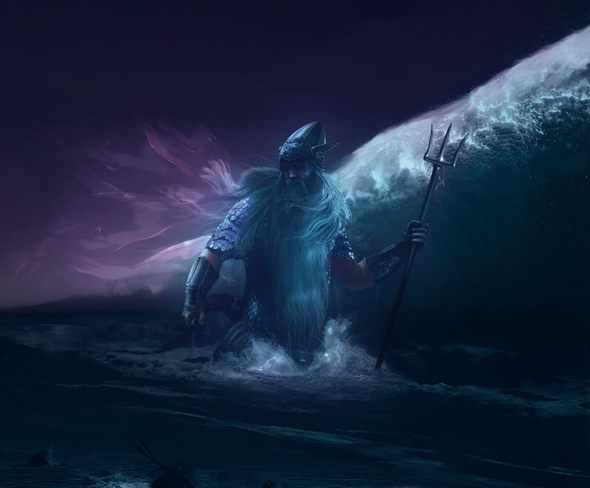 Alqualondë is also sadly remembered in the general lore for the cruel and tragic first Kinslaying, one of the most shocking events happened in the history of Arda, when Fëanor and his people attacked the Falmari,after the Mariners refused to give them their ships. 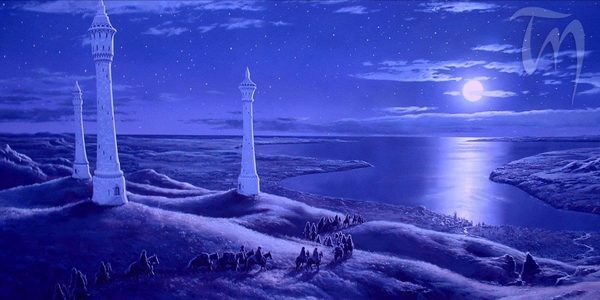 The center of the city is dominated by the High King of all Elves Ingwë's tower Mindon Eldaliéva, whose silver lantern shines far out to the Sea, as a magnificent lighthouse. 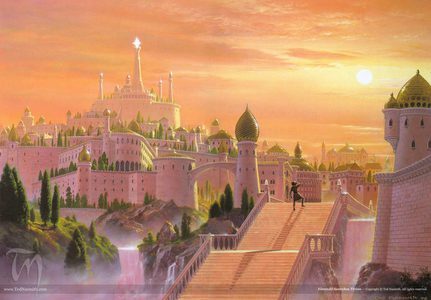 Tirion was the birthplace of various extremely mighty Noldor Elves that would have had in the future a pivotal role in the lore of Middle Earth, such as Galadriel, Fëanor himself, Fingolfin, Finrod and many others. 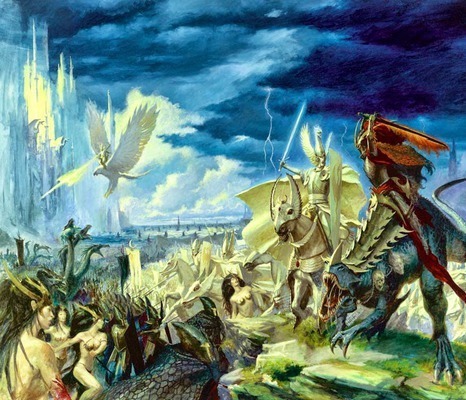 After the Vanyar eventually decided to settle in Valinor, Finwë became the king of the city and then his three sons Fëanor, Fingolfin and Finarfin established their respective Houses. 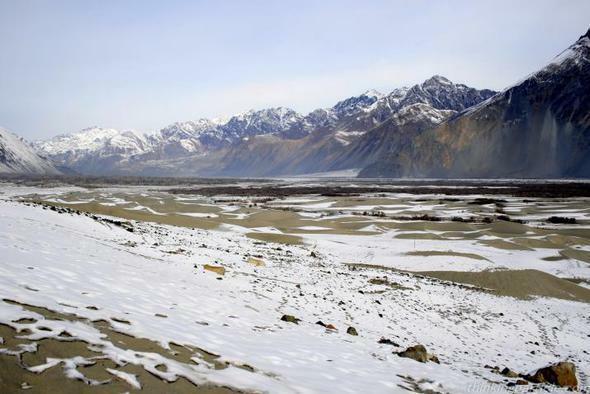 Araman is the cold and deserted land situated in the the far north of Aman, outside the Pelóri Mountains and along the northern coast of the same continent. 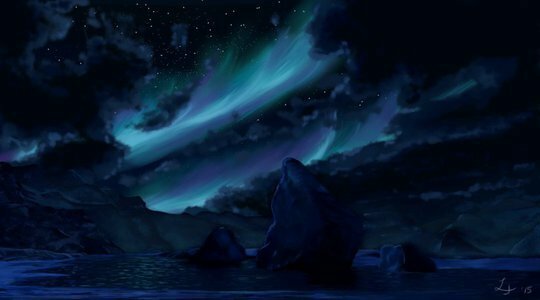 It was here that the Noldor, who were willing to leave Aman and chose the exile, were cursed by the Vala Mandos and heard from him their Doom. 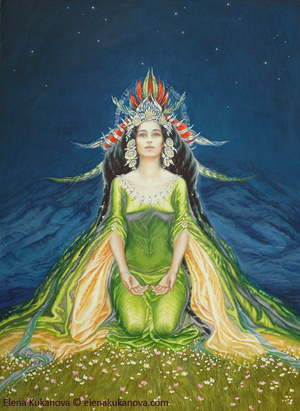 Notable places near Valimar are the Ring of Doom Máhanaxar and the Green Mound Ezellohar, where the Two Trees of Valinor were created by Yavanna, watered by Nienna and hallowed with Light by Varda. Many of these pictures are nit from the lord of the rings, but seen us, like a "real-life"-fil, when this is so, witch film is it? Thor and Thor: The Dark World. Clash of the Titans as well. By the way, is the film good? Depending on your definition of "good." For me, an avid fan of the Norse tradition, the Thor movies were hard to watch, especially what they did to Loki. As far as the remake Clash of the Titans go, if you like God of War-style deicide with Liam McIntyre , I mean Andy Whitfield , no, actually Sam Worthington (who looks exactly like the three mentioned above, and even acts in the same Jason Statham-style of over-used anti-hero) playing a low-brow, hard-nosed anti-hero who hates everyone and everything, especially the gods (because that's "in" nowadays: I've even seen Tolkien fans state that the Ban of the Valar was wrong and the Kings Men were justified in trying to take the Undying Lands by force), where CG graphics are emphasized over story, then maybe it is "good"
Back to topic please. Thanks. 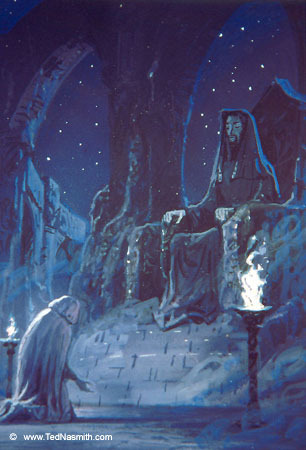 The Valar were probably helped even by the sentient and non sentient magical and mysterious Creatures of Aman, unknown in Middle Earth; while Melkor could certainly count on all the evil Creatures and Spirits he had previously corrupted, and on the newly-created race of the Orcs, by torturing and deforming the Elves in captivity with Evil Arts and Black Magic. 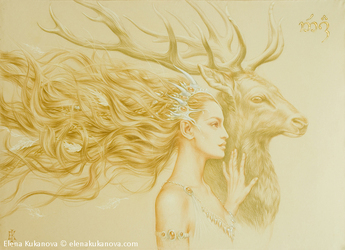 The War for Sake of the Elves was a titanic and destructive War started by the Valar in the second part of the Years of the Trees, meant to contest the absolute dominion of Melkor upon Middle Earth and, mainly, to prevent him from harming even more the recently-awakened Elves in Cuiviénen, or even marring irreparably their essence; this War was started for the Love of the Valar towards the Elves, the Firstborn Children of Ilúvatar, and this purpose was never forgotten by Melkor. The War lasted for almost 9-10 Years of the Trees (almost 100 Years of the Sun) and damaged and marred forever many lands of Middle Earth, modifying again its general appearance. 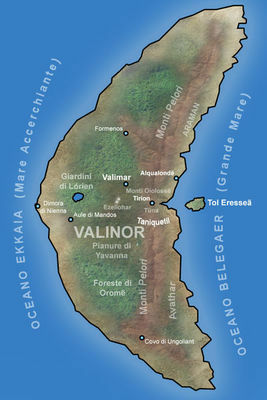 The Valar and the Maiar of their People had already established in Aman for millennia after the destruction of the Two Lamps and the End of the original Perfection of the World and founded Valinor, the Blessed Realm; the Archangels had then fortified their Holy Land with the indestructible Wall of the Pelóri Mountains and finally gave life to the legendary Two Trees of Valinor, which used to make this Land the only enlightened one of the World. But the Valar still worried often about the sad fate of the dark and dangerous Middle Earth, forsaken to the terrible and malicious power of Melkor, who, however, never dared to get out from his fortress of Utumno in the far North East, always fearing a sudden assault of his enemies from the West; his powers, though, had been constantly and gradually poisoning the East of the World and corrupting all the surrounding living things, while his vicious Servants often terrified these same territories. 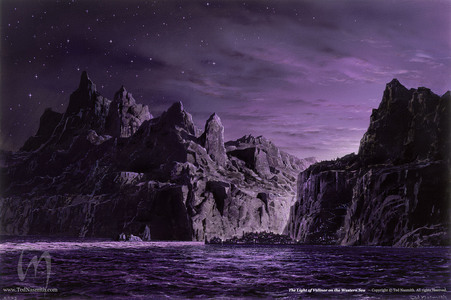 In these perilous times, the Elves awakened at the shores of Cuiviénen (in the Far East), under the Stars created by Varda. 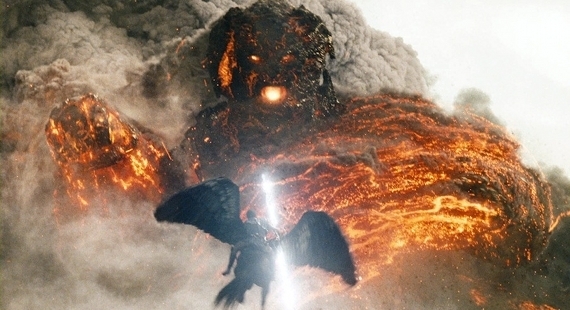 Melkor, due to his numerous spies, was the first one to notice them, and subsequently sent them many evil creatures and spirits; he also captured many of them who had decided to leave their birthplace to explore the surrounding areas, and started to turn them into deformed and evil creatures, the Orcs. 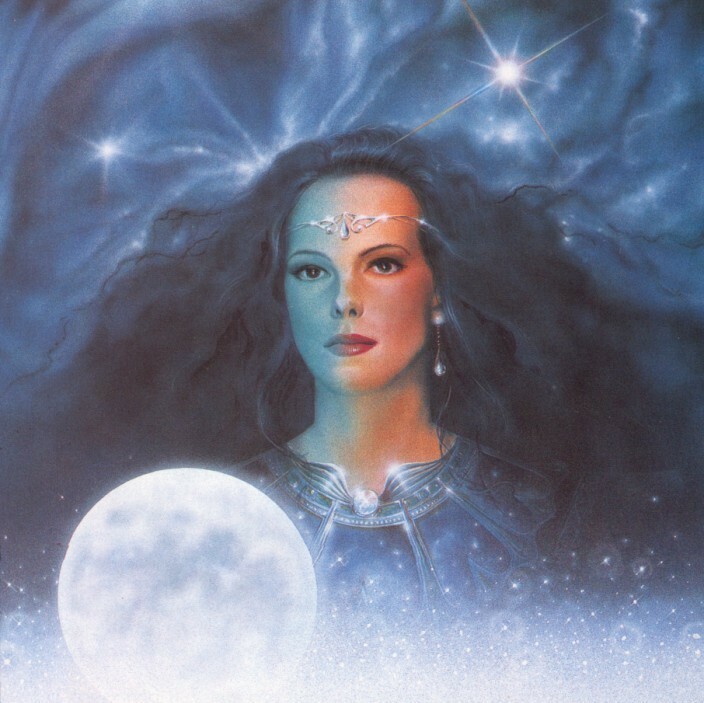 But, even the Vala Oromë discovered the presence of the Elves, during one of his multiple journeys through Middle Earth, and informed later the other Valar. 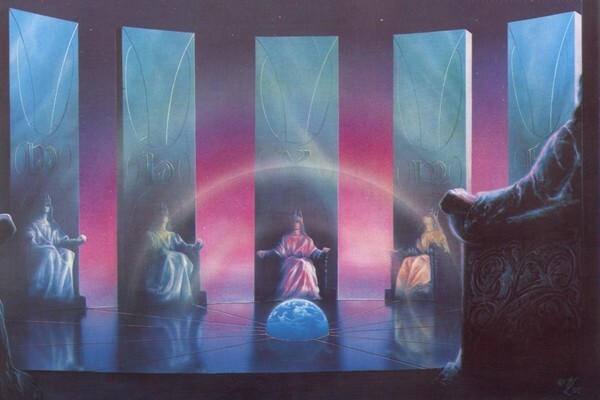 Upon their thrones in Máhanaxar, the Archangels took council and eventually decided to move war to their great Enemy for the safety of the First Children of Ilúvatar, and to make his plans for the World useless. 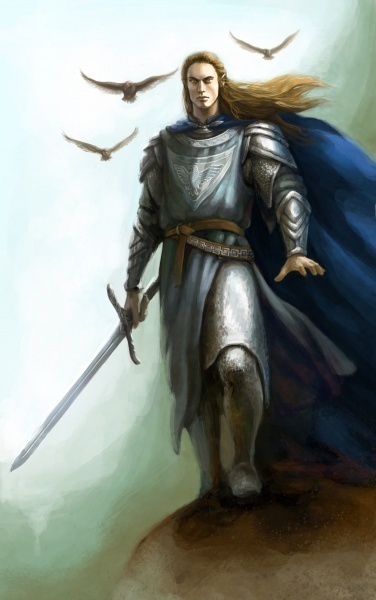 It is not clearly stated if all the Valar were present during the entire time of the War, then many speculations are possible; but it's logical to infer that Tulkas and the Aratar (the mightiest of the Valar) were present during the most difficult moments of the War. The Elves were never involved in any fight or part of the War, but managed only to witness distant and very far Lights and Fires caused by the violent confrontations between the two Powers. 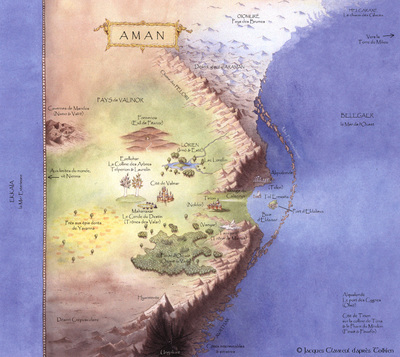 The Battle of the Powers was the initial phase of the War and it mainly involved the Lands in the North West of Middle Earth (the future Beleriand), connected to Aman via the frozen and dangerous pass of Helcaraxë. 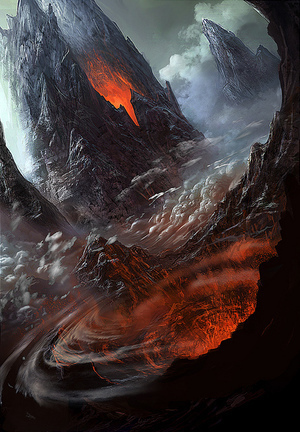 Melkor didn't probably expect such a violent and sudden assault, but he had previously built the fortress of Angband in the northern icy wastes of these territories, to guard the borders with Aman, deeply excavated in the Iron Mountains as it was Utumno, but on the opposite side of Middle Earth; Sauron was probably the chief and guardian of Angband, along with some Balrogs and many evil and foul creatures. 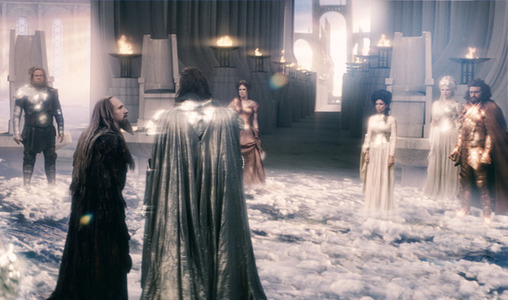 The strike of the Valar was very fast and violent, and caught the enemies unexpectedly. 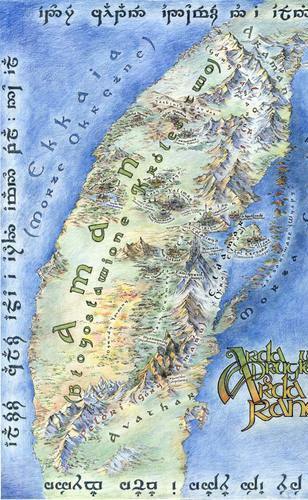 The Host of Valinor, mainly formed by Maiar, passed the cold desert of Araman and the Helcaraxë, and arrived in Middle Earth, suddenly attacking Angband and all the evil forces there present; the enemy dark ranks were utterly defeated and exterminated, and the gate and walls of Angband were completely torn down by the fury of the Army of the West. 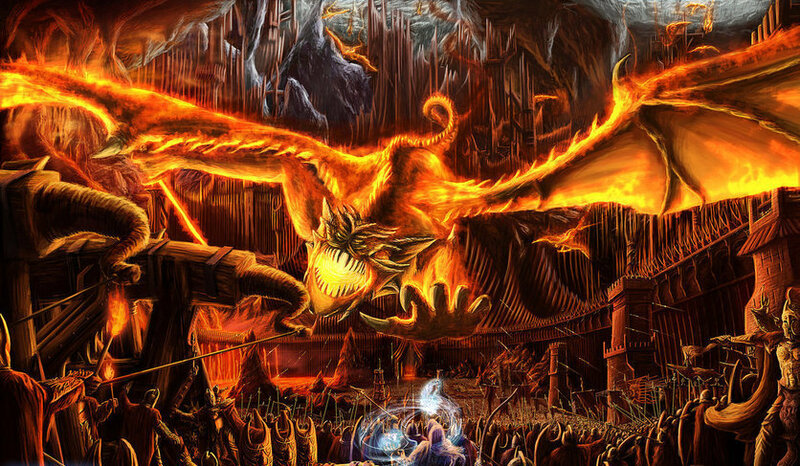 If Sauron was ever present in this Battle, he probably managed to escape and hide himself in the deep Darkness of Middle Earth, waiting for the proper time to be active again and prepare the return of his terrible Master; furthermore, the Host of the Valar didn't unfortunately manage to discover the deepest dungeons and pits of Angband, in which many Balrogs, foul creatures and Orcs found refuge, for this was the first attack, and were mostly concerned of securing the Elves in the East from the direct threat of Melkor. 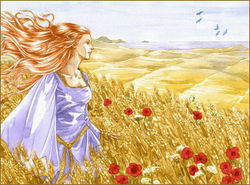 The Host of Valinor, then, moved to the East and put the Guard on Cuiviénen to secure the recently-awakened Elves. 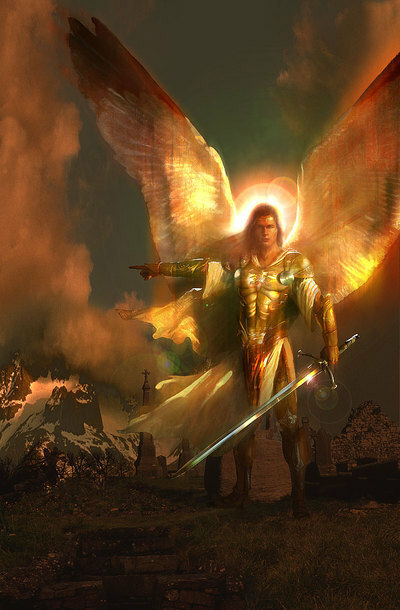 The Elves never took part in any phase of the War, but witnessed from afar the consequences and violent effects of the furious fights, and saw the Archangels and their Angels in their majestic, but still dreadful, forms of terrible and extremely powerful Warriors. 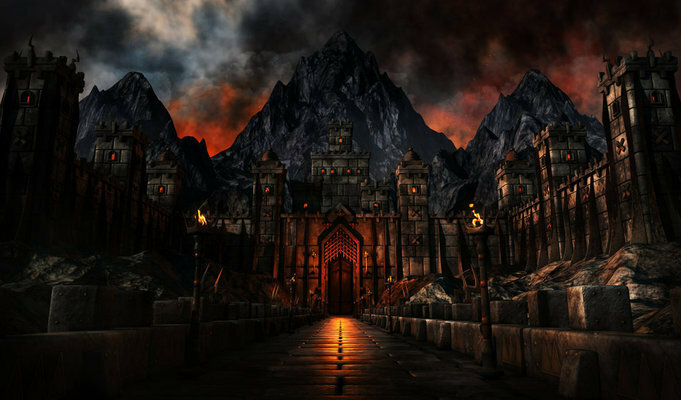 The final phase of the War was inevitably the apocalyptic Siege of Utumno, centre of Melkor's Power in the World, and source of all the sorrows and wounds of Arda in the previous millennia. This titanic Battle lasted for many years, and was definitely the longest and most difficult moment of the War; all the possible strongest forces of both the Good and the Evil were brought there to challenge each other, as an ultimate Battle between the Light and the Darkness. The Elves could feel from afar the ground trembling and see distant and enormous Fires and Lights in the dark and starry Sky of Middle Earth in the ancient and legendary Years of the Trees. 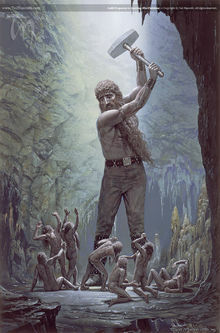 Before the final attack on the fortress, there were numerous violent battles at the doors of Utumno, involving not only Orcs or other corrupted and foul Monsters, but mainly the terrible Valaraukar (Balrogs), the great Demons of Fire, the Dark Maiar who served Melkor; and there were many of them in Utumno at that time. 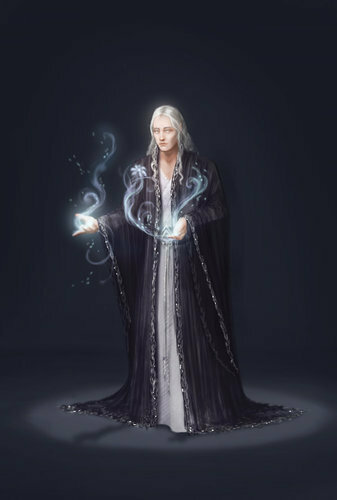 The whole power of Melkor was reversed in Battle, but it's not clear, though, if the Dark Vala himself was ever involved in direct fights, or remained safe in his Fortress; on the other hand, it's possible and logical to infer that all the Valar (or at least the Aratar) were present to lead their Holy Host. Utumno, then, was finally assaulted. Its Gate, Walls and Halls were completely destroyed and unroofed, and the Power of the Valar descended in the darkest depths of Utumno. 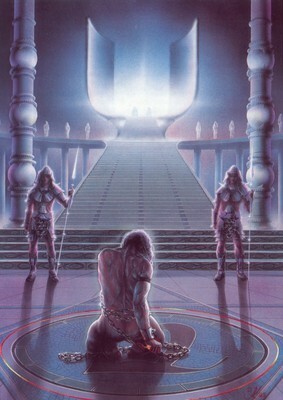 Melkor retreated and hid himself in the deepest and darkest hall of the fortress, but then the Vala Tulkas, the Champion of the Valar, stepped forward and directly challenged Melkor. 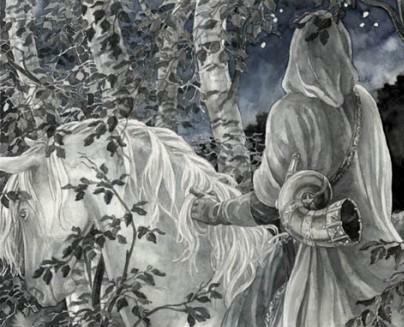 Tulkas defeated Melkor and chained him with Angainor, the indestructible Chain created by Aulë. 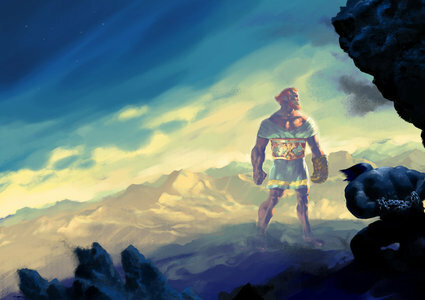 Utumno was completely torn down and cleansed forever, and all the other Lands in the North East were laid waste by the terrible power and energy originated from the War; Mountains were levelled, new Rivers and Seas were excavated, and the shape of the World was violently changed again. But the War and all its consequent destruction were inevitable and necessary to defeat Melkor, even though some of his Servants managed to escape and hide themselves. 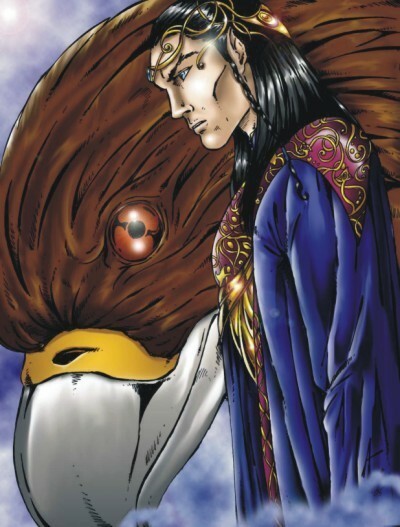 Angband and Utumno were destroyed, the evil forces were defeated and Melkor was brought in chains to Valinor, where he begged forgiveness at the feet of the Holy Throne of Manwë; Forgiveness that the King of Arda didn't grant him. 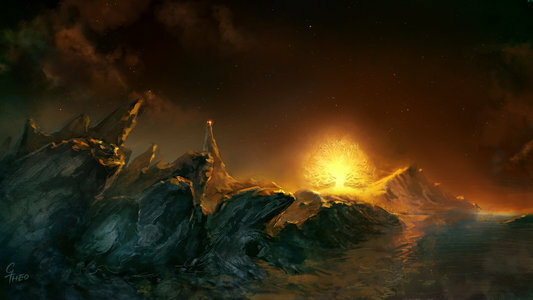 Melkor was thus brought to the Prison of Mandos in the Halls of Mandos, of which no Vala, Maia, Elf or Human could have never broken out, and was left there for more than 300 Years of the Trees (more than 3000 years of the Sun). 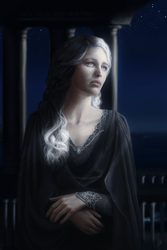 The Elves were finally safe and free from the threat of Melkor, but the Valar still feared that they could have been negatively influenced by the still-remaining Shadows of the Enemy in the World, and also desired their company, being amazed by the Beauty of the Firstborn. 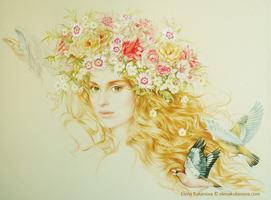 Then, the Valar decided to invite the Elves in their Blessed Realm, hallowed by the Light of the Two Trees, and chose three ambassadors among the Eldar to be brought to Valinor to convince their people; they were Ingwë, Finwë and Elwë, who later became High Kings of their respective kin. 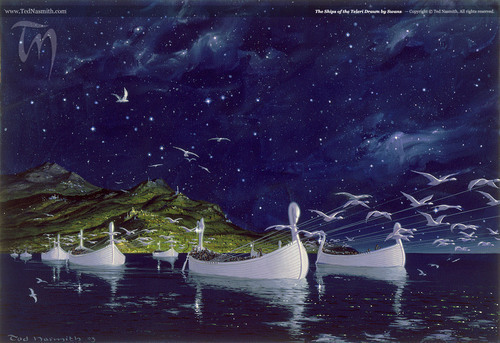 The three Ambassadors were completely amazed by the Splendour of Valinor, and were thus accompanied back to Cuiviénen, to convince their people to accept the invitation of the Valar. Then the Great Journey, or March, of the Eldar through Middle Earth began. 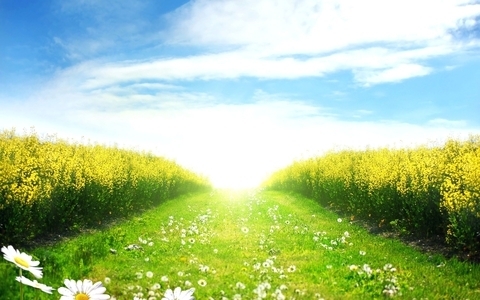 Are you planning like this through whole First Age? Probably, but now I am mainly focusing on the Years of the Trees and on the events happened in Aman or on the actions of the Valar in Middle Earth; while the First Age mostly involves the Eldar in Beleriand (Middle Earth). Maybe you can add some maps which shows difference between Utumno and Angaband. Think that would be nice. Was Udun other name for Utumno? Think I read that on some map with Lamps in time before all of this.